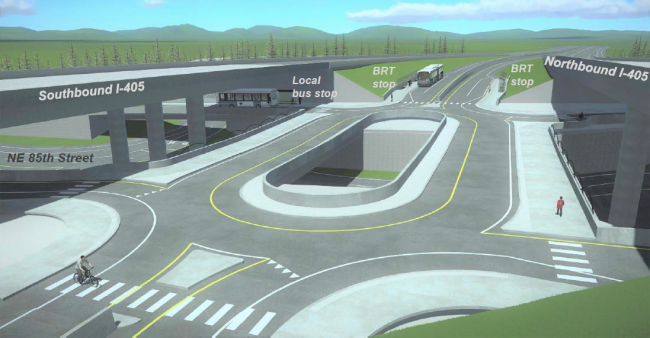 At an open house on Thursday evening, WSDOT and Sound Transit shared design concepts for the I-405 BRT station at NE 85th St in Kirkland. The station is an ST3 project opening in 2024. The latest design features better connections to local transit and an improved pedestrian environment. None of these make up for the poor location choice. The station will serve just a few hundred riders daily after a capital outlay planned to exceed $300 million. A film documenting the construction of Hong Kong’s Mass Transit Railway in the 1970s and 1980s. 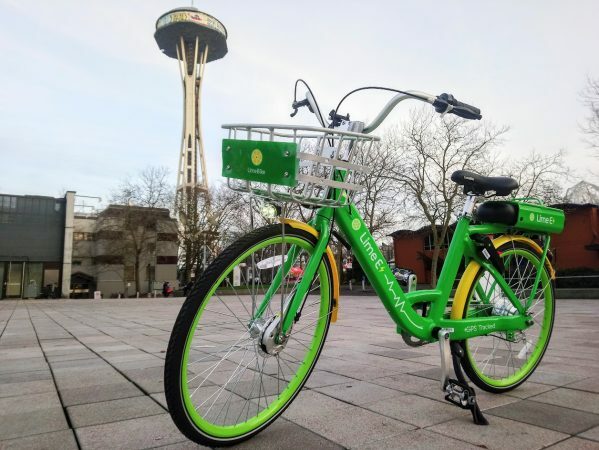 Seattle Parks and Recreation presented details to the City Council April 17th of a pilot program to allow electric bikes on Seattle’s multi-use trails, like the Burke-Gilman (video of council hearing). This follows on the heels of state legislation classifying various kinds of e-bike. The pilot, which runs through Summer of 2019, will allow for Class 1 and 2 e-bikes to ride the trails at speeds of up to 15mph. Electric bicycles represent a truly revolutionary change in the way we get around the city. LimeBike’s e-bikes have been in service in Seattle for months and will soon be coming to Bellevue. You can now purchase an electric bike for around $500 on Amazon. Cargo models have room for kids and groceries (and the insinuation that e-bikes are only for rich tech bros is frankly insulting to all the families who save money by using an e-bike to get around town). Around the world, e-bike use is growing astonishingly quickly. Germans bought 720,000 e-bikes last year (and just 25,000 electric cars). 45% of all bikes sold in Belgium are now e-bikes. The CEO of Bosch (maker of electric drivetrains), estimated that 65% of all bikes sold will soon be e-bikes. 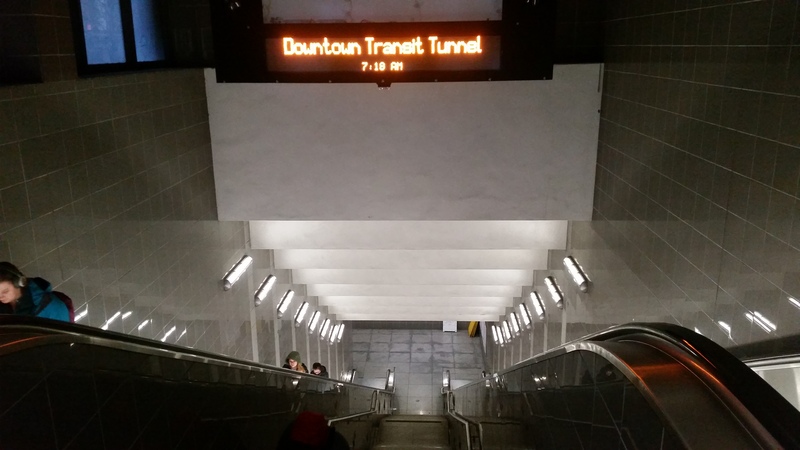 Sound Transit’s rider-hostile escalator policy is under scrutiny right now, but there are similar problems with escalators in the Metro-run Downtown Seattle Transit Tunnel (DSTT), extensively renovated for light rail in 2008. In some cases, we can reverse the adjacent escalator to go up instead of down while the up escalator is out of service. We did not do so in this situation because it requires safety adjustments that are very time-intensive. This is because the step chains wear differently when running in an opposite direction (most people tend to stand to the right, which causes the right side of the chain to stretch more than the left). This difference can cause the escalator to malfunction when running in the opposite direction unless the step chains are adjusted so that the treads will align correctly with the combs at the opposing end. Sometimes it can take as long to complete that process as it does to repair the escalator that is out of service. If there are complications, that can lead to both escalators being out of service. So we consider several other factors, such as: How long will it take to repair the other escalator? What other conveyance options are nearby? Are any public events scheduled during the forecasted down time? In this case, we considered these factors and decided the best option was to stay on track with the original plan and repair schedule. The moral of the story, I guess, is that even seemingly simple fixes turn out to be really complicated. It’s actually easier to fix the escalator than reverse the other one. What’s apparent is that the contract with Kone doesn’t require a particularly high level of service, and we can expect long outages in the future. First Hill is an area in the city where SDOT is actively moving forward to add transit priority lanes, and they want your feedback. 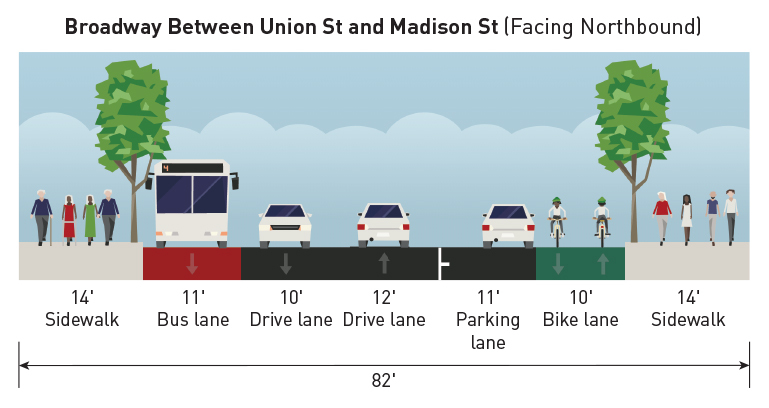 As we wrote about last spring, the agency would like to create a transit-only lane on southbound Broadway between Union and Madison. This is often a point of congestion in the PM peak, so transit priority would be welcome, boosting not just the First Hill Streetcar but Route 9 and 60 as well. Creating a transit lane means eliminating the center turn lane, so SDOT is also proposing restricting left turns at Pike, Union and Madison. The net effect would be a substantial decrease in travel time for all modes. Transit could see a 2+ minute time saving, while travel time for cars would also decrease slightly. Our final installment in the ST3 Level 1 alternatives commentary takes us through SODO. The industrial area south of downtown is notable in our series in that it is currently served by light rail, which runs along the E-3 busway between 4th and 6th avenues. The new alignment, like the current one, would have a station at S Royal Brougham Way and another at S Lander St. Sodo is also where the N-S “spine” from Everett to Tacoma is split in two. A new line would be constructed in parallel, allowing for West Seattle trains to connect to the existing downtown Metro tunnel while trains coming north from the Rainier Valley (and eventually Tacoma) are re-routed into a new tunnel to continue on to South Lake Union and Ballard. Overall, the exercise seems to be about connecting West Seattle and Downtown with as little impact as possible. What’s notable is what’s absent: any discussion of using an alternate N-S right-of-way, such as 1st Ave S. A 1st Ave S alignment would better serve the emerging nightlife and office space on 1st Ave, not to mention Safeco’s front door. Perhaps it was thrown out for technical difficulties or objections from the Port, but it’s unfortunate it wasn’t even considered as a Level 1 alternative. 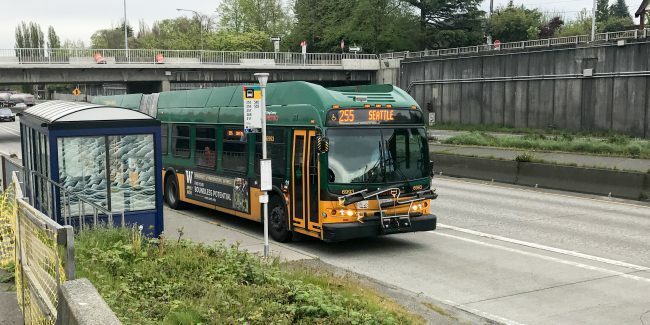 The once ambitious restructure of bus service between Seattle and the Eastside over SR 520 has been reduced in scope and is expected only to include a truncation of Metro 255 service at UW. 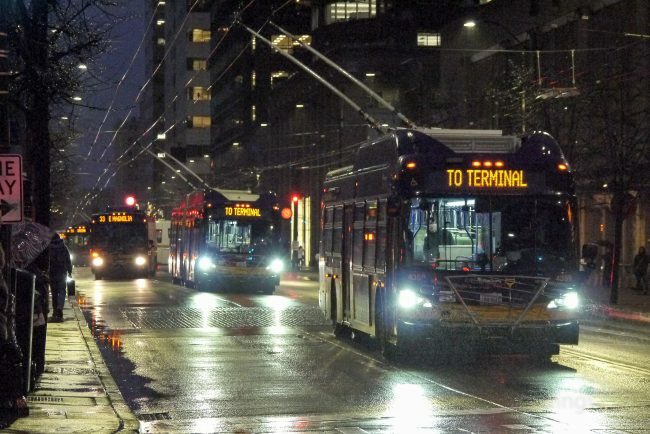 At last Thursday’s King County Regional Transit Committee meeting, Metro staff confirmed that Sound Transit no longer intends to propose any changes to their routes on the corridor. Peak-only Metro routes from the Eastside will also continue to serve downtown. The original restructure proposal had included ten routes, of which the greatest ridership is on Metro 255 from Kirkland and Sound Transit 545 from Redmond. The reduced scope of the restructure comes against the background of increased optimism about downtown bus movements during the ‘period of maximum constraint’. The removal of more than 800 daily trips from the downtown transit tunnel and construction elsewhere in downtown would strain street capacity and slow transit service without mitigating measures. The One Center City partners plan several changes to improve downtown capacity without removing so many buses from downtown. On 5th and 6th Avenues, a new northbound transit pathway can serve up to 40 buses an hour (though more likely 25-30 buses). Likely routes on this pathway are peak routes including 74, 76, 77, 301, 308, 316, 311, 252, 257. On 4th and 2nd Avenues, signal and priority changes will speed bus movements and give pedestrians leading signals improving safety when crossing. On 3rd Ave, all door boarding and all-day bus operations will speed operations there. Through travel for cars will be prohibited during day time hours, but cars will still be permitted to turn right on to the street and must turn right off the street after one block. SDOT, Metro and Sound Transit are sharing in the $30 million cost of street improvements downtown and in Montlake. Together, these steps allow buses to operate more effectively than they do today through downtown, with up to 25% better travel times on 4th Ave. The added pathway on 5th and 6th alleviates pressure on all avenues. Bus passenger capacity across downtown would increase by 3700 in the PM peak hour, and overall people-moving capacity by all modes would grow by 7500 per hour. 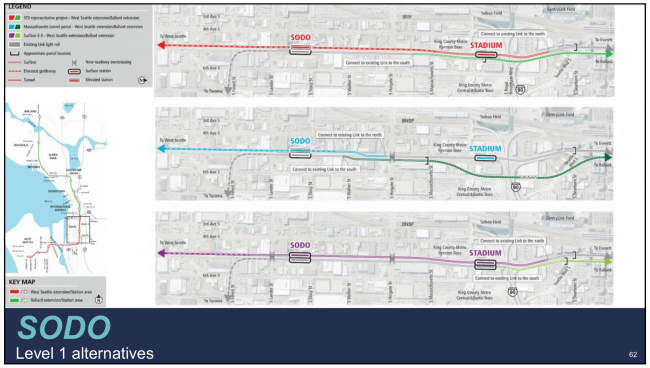 With greater downtown capacity, early proposals to truncate ST 550 at International District station, to route West Seattle buses to First Hill, and to loop route 41 on Pike/Pine, have all been shelved. 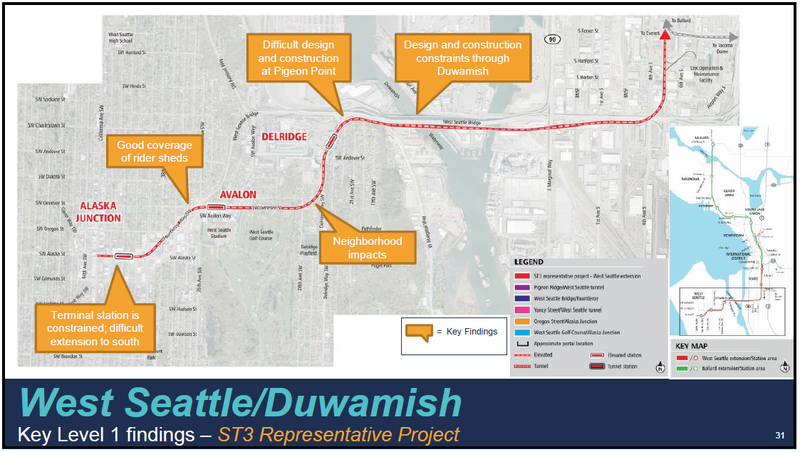 When voters approved Sound Transit 3 in 2016, they consented to a “provisional alignment” to take trains from roughly 15th & Market to the West Seattle Junction via South Lake Union and Downtown. A long line with a long tunnel through downtown required compromises. Although many felt at the time that ST’s budget estimates were exceedingly conservative, 18 months of Trump tweets and assaults in Olympia have soured the mood for adventurous budgets. Still, neighborhoods have understandable desires to undo some of those compromises. Most of these ideas would create measureable improvements to the usefulness of the system. Moving the Ballard station west of 15th is a debate about what will bring the most riders. Improving the ship canal crossing would make trains more reliable. Stations in South Lake Union and/or First Hill would add some of the densest neighborhoods in the Pacific Northwest into the system’s walkshed, inevitably boosting ridership. Among these ideas, one stands out as being primarily aesthetic: burying the elevated track around the West Seattle junction in a tunnel. Although elevated track has hardly turned Chicago and Tokyo into dystopias, one shouldn’t single out tunnel advocates as especially unreasonable: as a region, we’ve never built elevated track through densely populated areas, opting for tunnels or surface lines instead. Advocates are asking for the same things as other neighborhoods. Still, it is hard to identify a clear way in which burying the track would improve mobility in Seattle. People broadly accept that we have a transportation crisis. The fixed budget for grade-separated transit should be focused on solutions to that crisis, not subjective concerns about appearances. And what’s good for West Seattle is good for other places: it would be a better outcome for transit if other segments that follow the street grid, and can therefore run elevated, were lifted to fund better station placements elsewhere. However, the status quo has great power. The easiest place to elevate track is where the plan already calls for it. If there is any flexibility to increase scope at all, there are higher priorities. The STB Editorial Board currently consists of Martin H. Duke, Brent White, and Dan Ryan. 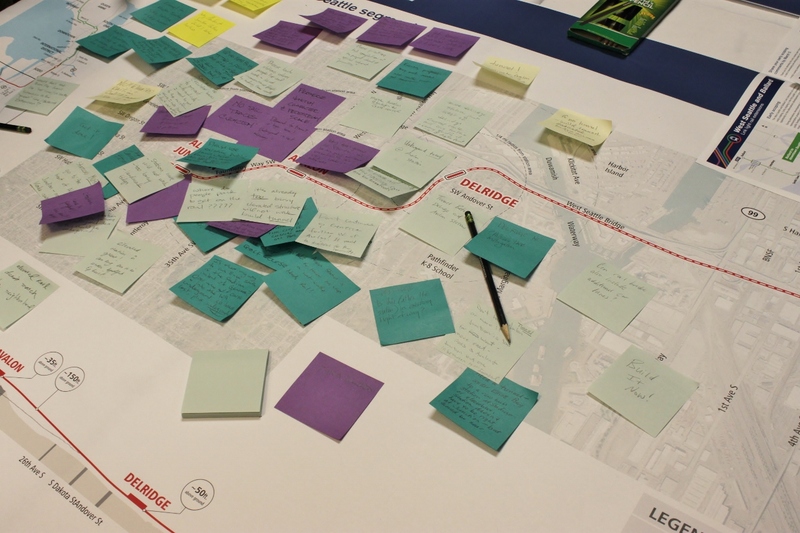 Last week we described the latest concepts for light rail in West Seattle and Ballard. Today, we’ll talk about the path through greater Downtown, from Lower Queen Anne to Chinatown. 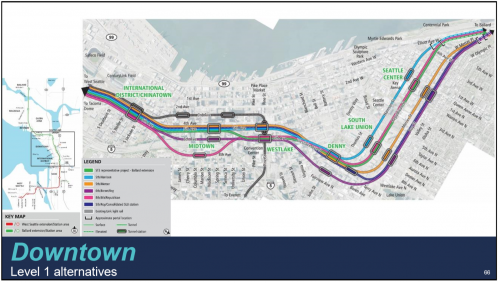 In a deviation from the follow-the-monorail theme of other segments, the representative alignment skirts the edges of Belltown to provide a direct line to South Lake Union. What side of I-5 should Midtown Station be? To the West, in the walkshed of the existing DSTT, or to the East, serving the density of First Hill while forcing two crossings of I-5? One issue with the 5th Avenue alignment is the foundations of buildings there. Should the new Westlake be under the old Westlake, or just to the East? How far apart should the SLU stations be, or should there be just one? Under which street should the tunnel swing west: Roy, Mercer, Republican, or Harrison? Republican and Mercer turn out to have sewer conflicts that increase cost and risk. 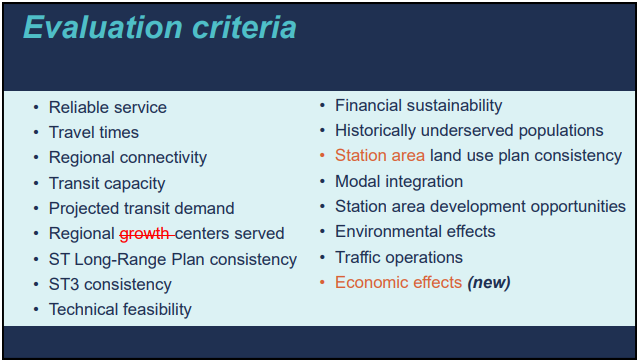 Interestingly, using the evaluation criteria, all of the alternatives score worse or no better than the original alignment on every metric, except that (surprise) consolidating the SLU stations into one makes things cheaper and easier. Explore the interactive documentary from Hervé Cohen that reminds us that beneath the surface, we’re all connected. Yesterday we discussed the first cut of alternatives for light rail to West Seattle. Today we’ll focus on Ballard and Interbay at the opposite end of the line. The general route is a familiar one, dating back to Forward Thrust in 1968, showing up again in the Monorail vote in 1997, briefly making an appearance in the 2013 Sound Transit studies and emerging in 2012 as the RapidRide D line, the second-busiest route in Metro’s system with over 14,000 daily riders. While there have been many arguments about the merits of connecting Ballard via UW (arguments which almost certainly will be rehashed in the comments section below), regional and city planners have long preferred the downtown connection via Interbay and 15th Avenue W.
After community input, there are 6 alternatives under consideration. On its way to producing a single “preferred alternative” in early 2019, Sound Transit is in a year-plus process of collecting public input and screening a number of variants on the Seattle “representative alignment” voters saw before the 2016 vote. These “Level 1” alternatives are getting some basic, qualitative analysis across a wide series of metrics (below). The Stakeholder Advisory Group is reviewing these alternatives and will make its recommendations on April 24th. 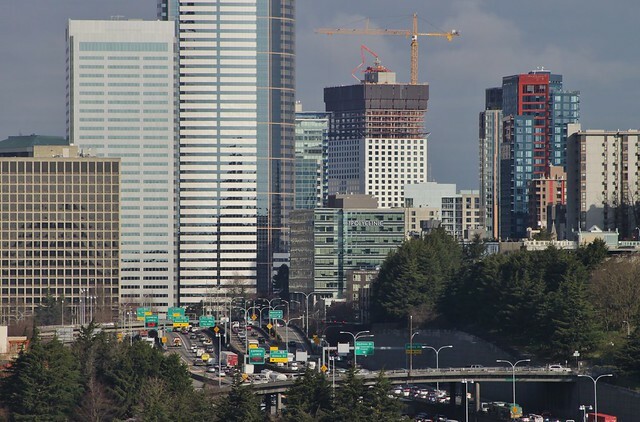 An Elected Leadership Group will consider this and make its own recommendations, and in May the Sound Transit Board will move a subset of these alternatives forward for further technical analysis and public comment. In West Seattle, the representative alignment is elevated tracks from Sodo to the Alaska Junction, with two stops at Delridge and Avalon. These three stations intersect the three main north/south corridors in West Seattle, each with frequent transit service. There’s sympathy, and then there’s policy. The choices that cash-poor, fixed-income people have to make are tough; those people that are also house-rich often didn’t choose to be house-rich, and can’t access the benefits without taking on some risks. There’s lots of room for sympathy. But it’s most fair and most practical (from a tax stability point of view) to tax both income and accumulated wealth. High-earners here get away with criminally low taxes and reform is needed so they pay their fair share. But it’s hard, from a policy perspective, to put property taxes first in line for relief in tax reform, rather than sales taxes. People with wealth in property have better choices and better means to make them than the poor people gouged by sales taxes and usage fees. California’s attempt to protect people from rising property taxes ended up being spectacularly poorly targeted, and easy for rich and well-connected people to effectively exploit to their benefit — in California people with lots of accumulated wealth are under-taxed as badly as high-earners in Washington, to the detriment of other taxpayers that bear higher burdens, and of the public realm generally. We’d probably do better by encouraging (and sometimes subsidizing or even directly building) more diverse housing types in more places, so that people that do move don’t have to move so far, than by trying to build tax policy around people living in the same houses for the rest of their lives (then passing those houses on to their children). There are lots of non-financial reasons staying in the same home doesn’t work out, and people making those transitions for any reason need better options and more support. In our interview with Cary Moon last year, the candidate shared an anecdote of an elderly homeowner who had to take in boarders to stay in her home. I wasn’t quick-witted enough to say it at the time, but this is the production of naturally occurring affordable housing. While no one likes to see sympathetic people be lightly coerced, dynamics like this operating at scale are the only thing that can solve the affordable housing crisis. Third Avenue in 2018-appropriate weather. Photo by Wings777. About two weeks ago, in the wake of her controversial decision to “pause” the Center City Connector streetcar project, Mayor Jenny Durkan announced the latest in the ever-evolving series of One Center City concepts. The unwelcome headline was a two- to three-year delay for the Fourth Avenue protected bike lane and other bike infrastructure. Mayor Durkan’s announcement was also paired with an interesting congestion pricing trial balloon. All of that may have distracted us briefly from taking a fine-tooth comb to the OCC materials, but it’s impossible to keep transit wonks away from poring over documents for very long. 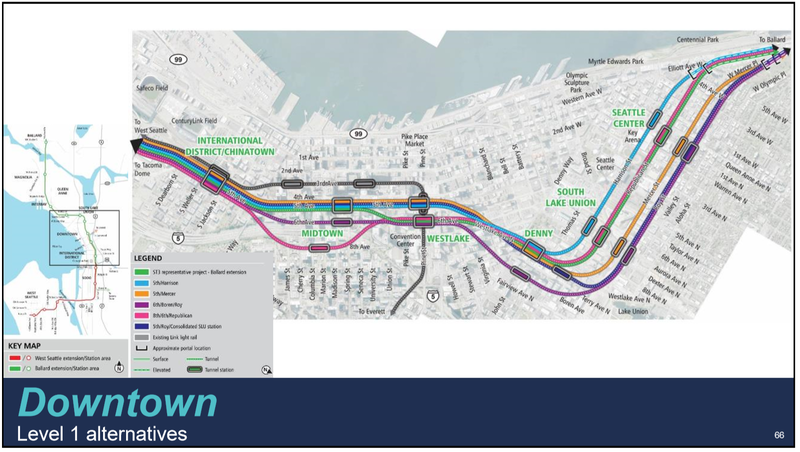 Seattle Subway gets credit for noticing a subtle change to the Third Avenue plans: “All Day Transit-Only Operation” on Third, one of the most exciting bullet points in the previous plan, became “extended transit priority hours” in the latest materials. It’s no surprise that we aren’t fans of the current approach. Describing the current situation as “transit only” doesn’t remotely reflect reality, as any rider of Third Avenue buses knows. Heavy car volume and turning cars frequently impede buses, particularly in the northern portion of downtown. Compliance by car drivers with the turn restrictions is low, probably because of a combination of driver confusion and willful flouting. And all of this is for the sake of a tiny percentage of users. Bus routes using Third Avenue carry well over 100,000 daily passengers, with Metro estimating that 47,500 of them board at Third Avenue stops. By contrast, when you subtract the 3,000 daily bus trips from overall vehicle traffic numbers, SDOT estimates that only 6,100 cars use the most congested portion of Third Avenue daily. Given the turn restrictions, many of those are using the street only to reach or exit nearby parking facilities. It’s time for Mayor Durkan to intervene in this process. She can and should turn Third Avenue over entirely to buses, at least during the day. That decision would be good policy, and also good politics. Read why after the jump. 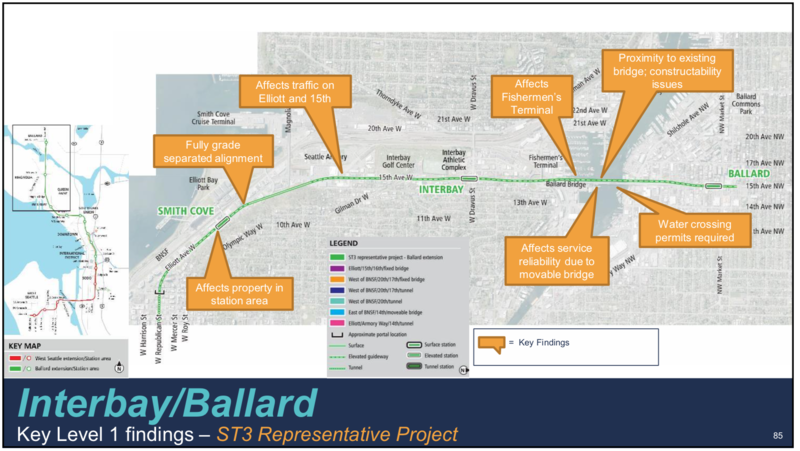 Ahead of the first neighborhood forums for the West Seattle/Ballard Link project, Sound Transit has published its full summary report of the early scoping project, which we covered last month. 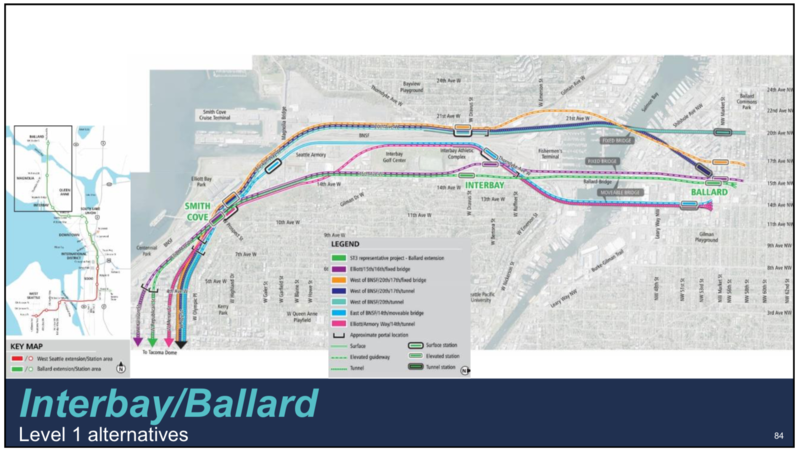 Some 2,800 individual comments were made at open houses, the online survey, and other forums, and many of them asked for the same modifications to the project: tunnels to Ballard and West Seattle Junction, better connections at transfer stations, and grade separation in SODO. Using these suggestions, Sound Transit has also produced some Level 1 alternatives for the project, which we’ll be covering in a series of posts this week (so stay tuned). The “Melrose Promenade” takes shape. Why New York stopped building subways. 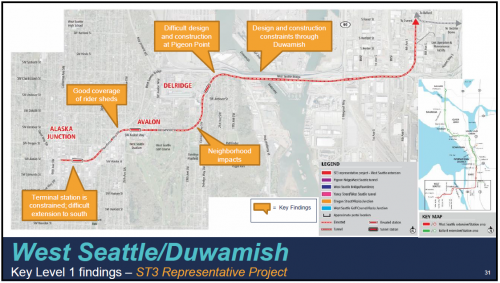 The summary of the first round of ST3 public comments is out. Mercer Island Station work starting. Federal Way and Tacoma Link open houses happening now. Kitsap Transit now has a dashboard for fast ferry key performance indicators. It’s only been 6 months, but the early record of the Durkan administration is not at all promising. Seattle gathering data for Uber/Lyft regulation. Scenes from the District 3 MHA public meeting. SDOT’s Rainier Avenue plan not very visionary. Denny bus lane finally in sight. Kitsap County looking at a $20 tab fee, but just for roads. Having failed to get enough signatures last year, Eyman’s pushing a car tab initiative again. A clear explanation of why Link doesn’t have turnstiles ($). Putting a Link station under Union Station sure would be pretty. Wenatchee’s transit plan scales back after public comment. Seattle Children’s nationally-renowned Transportation & Sustainability Department has two open program operations/customer service positions. This leadership position oversees the day-to-day customer service, business/financial operations, and administration of Seattle Children’s Transportation Department commute programs, including, but not limited, to commute concierge, new employee orientations, parking assignments, bike programs, Guaranteed Ride Home, and carpool, vanpool and transit perks. In addition to being responsible for supervising the department’s front line customer service staff, this position oversees the department’s daily and long-term business practices by administering, monitoring, and auditing financial transactions with internal and external stakeholders and participating in the annual budgeting and strategic planning process. Our ideal candidate has at least one year of supervisory experience, excellent interpersonal and customer service skills, is a critical thinker and problem solver, is anticipatory, and has demonstrated experience with basic accounting and billing practices, supporting front line customer service teams, and maintaining databases. Read the full job description and apply online. The position will remain open until filled. The Administrative Coordinator provides a wide range of administrative, program, and business systems support as well as data management tasks. This position directly supports the department director and other department leaders by scheduling meetings, arranging travel, maintaining calendars, etc., and works with confidential, time-sensitive materials. This position is responsible for updating the team’s use of visual management tools to track, monitor and manage data, performance goals, and operational impacts and is a critical member of the department’s customer service team, providing front line program and customer support both in-person and via email. Our ideal candidate is detail-oriented, anticipatory, has excellent interpersonal and customer service skills, can handle complex scheduling using Outlook, has experience with basic accounting and billing practices, and has the ability to handle multiple tasks and competing deadlines with a calm demeanor. Read the full job description and apply online. The position will remain open until filled. In another unfortunate setback for Vision Zero and the Move Seattle Levy, SDOT has elected to remove the dedicated bus lane planned for 24th Avenue to give more space to cars. 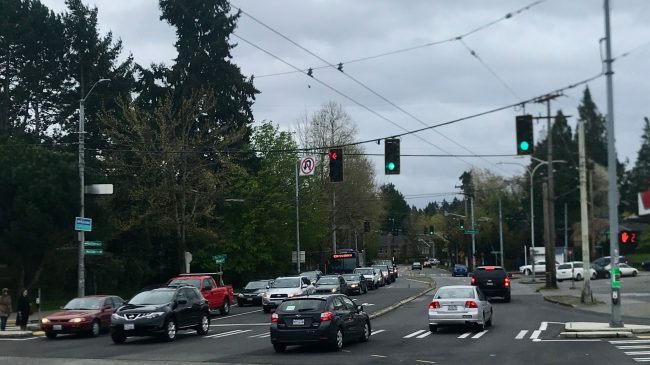 23rd/24th Avenue, home to the 43 and 48 routes and used by over 6,000 bus riders daily, is one of Seattle’s supposed “transit priority corridors” (a phrase that grows ever more meaningless), slated for RapidRide buses in 2024. The 2015 Transit Master Plan called for bus lanes from Thomas St. to Roanoke St., almost all the way to the Montlake bridge. As the plan has evolved, neighborhood opposition has increased and the bus lanes have been walked back, until this month, when they were scrapped entirely. The public comment is the usual incoherent mishmash (“make it safe for pedestrians and also we want to drive faster!”). SDOT appears to have taken it literally but not seriously, as the saying goes. Despite referring to the corridor as a “vital street for transit,” no effort will be made to improve bus service. The agency is, however, proposing a “skid resistant surface” to be applied at the intersections where the most collisions occur. So there’s that. And while the reduction in downhill lanes between John and Boyer will probably reduce driving speeds, the project has fallen disappointingly far from the original 2015 vision. No North American city has more chokepoints than Seattle. The city itself consists of three peninsulas with narrow water barriers between them. Further barriers are created by steep hills in most parts of the city. Nowhere in Seattle can you travel in a straight line for more than a few miles without going into the water or over a cliff. …Transit planning is frustrating in such a place, but road planning is even more so. Ultimately, Seattle’s chokepoints have the effect of reducing much of the complex problem of mode share to a critical decision about a strategic spot. If you give transit an advantage through a chokepoint, you’ve given it a big advantage over a large area. The Montlake area is one of Seattle’s major chokepoints, as traffic backs up in all directions approaching the intersection of Montlake Boulevard and SR 520. Transit priority ought to be a no-brainer. WSDOT made the wrong call with the 520 offramp, which was quite unfortunate, but I expected more from SDOT. As cost overruns pile up on other transit and infrastructure projects, red paint for bus lanes remains the cheapest and most effective way to move more people through our limited, chokepoint-filled right-of-way.